I was changing Abby's diaper yesterday and noticed a crinkling sound coming from the kitchen. I thought Allie our cat had gotten into the pantry. Nope, it was Miss Olivia. She crawled from the dining room into the kitchen and got Ramen out of the bottom shelf and started chowing down on it. She's looking pretty proud of herself, isn't she? When I got back I captured this look from Abby. So she got one to. Umm...can you say "Baby Jail"? and super fast please. Things are pretty great around here. I know I haven't done a major update in awhile. But that's ok cuz today there's LOTS to talk about. Gosh, first of all. Olivia is sitting up. She has been for several weeks now, but I just haven't posted it. Yay Olivia!! She also has her third tooth. It is on the bottom left if you look in her mouth. She got it last week. Abby has one about to pop through on top. Olivia got the jump on Abby by a few days. Olivia started Monday and Abigail figured it out yesterday. They love to get around now and are quite pleased that they can go under their jumperoo. As soon as she got that tooth, she was so happy. We could tell it really hurt her. She has started to laugh softly at EVERYTHING; her snack, her blanket, her toys, at us. She babbles so sweetly when we play with her. And she is just one big smiley baby. This is what she looks like every time I try to put her down on the floor to play. She cries like her little heart is broken. I know her top teeth have got to be hurting her. She is happy most of the time, but def not herself. She still clamps her mouth down tight whenever she does not want to try something new. And, ugh! Don't even get me started on our sleeping or lack thereof. That is a whole 'nother post entirely. I have maintained my weight over these past two weeks, so I still need to loose 17 pounds to reach my goal by April. Ummm... may have to adjust that...maybe...a little. My goal this next week is to loose 1 pound. Now that we have cut out our coupons you will need a place to put them. You can choose any kind of small holder. I found mine at a office supply store, but I also found one in the Dollar section at Target last year. I found a few on-line that would be good as well. 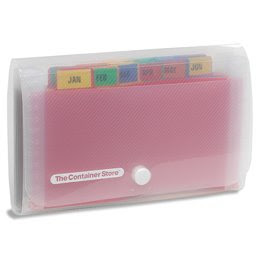 Check this one out at The Container Store. Or these you can find at Amazon. this one by Jokari for $3.99. divided by isles at the grocery store I shop at. I actually wrote down what each isle had the last time I was there so I could organize my little coupon filer. I leave 2 spaces at the front to put the coupons I am using that day and the coupons I have been given previously like CVS Extra Care Bucks or Wal-greens Register Rewards (we will get to these eventually) You can organize yours however it works for you. I have to admit I am salivating a bit over the 13 pocket one from The Container Store. I had to double up some pockets on mine and that DID NOT make this lady happy. Even if you use an envelope at first just make sure you have it every time you go shopping. Now, about those packets you put in a safe place. 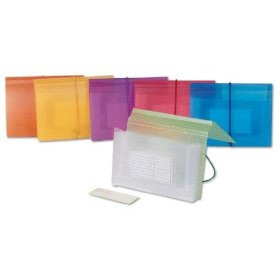 I put mine into file folders by month then into a large plastic file holder. I got this one from an office supply store, but you can get them anywhere like Wal-mart or Target. If this seems a bit much for you at first, that is fine. Just stick them in a folder at the front of your file drawer, but know that if you are truly going to get serious about this, these packets will need a home. If you look at the spine on each packet in very tiny letters it has the date the packet came out. This is the date you will reference back to each week when you start looking at your list. Note: I started in July of last year. After I took this picture I cleaned out August and September. That's it for this little mini-lesson. How is everyone feeling? Too slow for you? Just right? Please can we just get into the nitty-gritty?? Let me know. If you have any questions feel free to email me at blueladybug77 at sbcglobal dot net until I get my other one up and running. This week when your grocery flier comes out, sit down with it and see if any of your coupons can be used next week. We will go a little more into this next time on Sunday. One more thing: My first giveaway!! 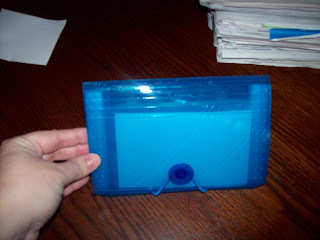 I have an extra 7 pocket coupon file holder. I will tell you straight up it is the $1 one I found at Target last year, but it will definitely get someone started. 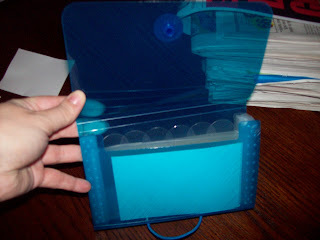 It even has labels to fit the half circle tabs. I LOVE little containers like these but I am ready to part with it for the sake of you, my readers. Enough already, just tell me how we can win, right? If you are not a regular follower, leave your email addy so I can get a hold of you when you win. ~Blog about the giveaway and get an extra entry. Be sure to leave a second comment and tell me you blogged about it. I will either use random.org or I will have Zachary pull a number from a hat. I post the winner on Sunday morning, so you have until then to post a comment or blog. Lunch - Subway - I am totally mad that our Subway no longer carries spinach. Grrr!! You just throw a chuck roast in the crockpot in the morning with a jar a barbecue sauce and let it cook all day. Then pull it apart with a fork for shredded beef. Dinner - Teriyaki Chicken - third times a charm, right?? We received some very sad news yesterday. My post about Brook's girls that I put up a few weeks ago told about her twin girls who have a rare genetic disorder. Things moved far faster than any of us even could imagine and sweet little Carynne passed away yesterday. Tonight we received the news that her sister Sydney joined her. We are just devestated for our friend. I can't imagine what she is feeling right now. Please remember her and her family in your prayers tonight. If you would like to follow their story you can go to Brook's blog here. I am not sure if she will keep it up now or not. Also, we have raised over $4000 to bless this family with. We are discussing several things to do with the money including memorial trees, stars named after the girls, or other things like this to help remember these sweet sweet girls. If you would like to help out there is a link there in my sidebar. Things will have to change if I am going to be a part of BlogHer ads, which will be coming this week. I am working on fixing a header to be smaller and hopefully it will still have the look I am going for. Bear with me because I am playing around with the spacing and such. What looks good on my PC doesn't on my laptop which has a wider screen. I may just break down and pay someone to make me a header and layout. We'll see. Meanwhile, enjoy this. I have to admit I missed my tree up there with the spring flowers and I am glad it is back for a bit. First off, if you think you can just go for it and jump in with both feet, you can go to The Grocery Game or Coupon Mom to get started. Both sites have great information on stockpiling with coupons. But if you are wanting to just try it out in baby steps, then I hope I can help. ~Coupons - Start out with 3 sets. This will not be too overwhelming at first. I buy 6 now at a time, but wish I would have started out a little slower. Also, my grocery store doubles and triples coupons but only 3 of the same coupon so this is another good reason to start out with just 3. 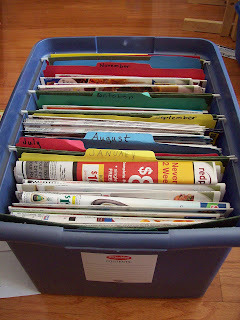 ~space to sort out the coupons. You will need a table, countertop, or even the floor. Give yourself plenty of room to lay out all the pages. There are only two different sets of coupons this week. Red Plum and Smart Source. 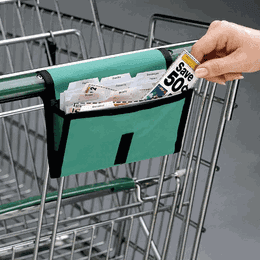 Take one packet at a time and sort your coupons by page. You should have 3 copies of each page. Soon you will be coming back to these pages to find a coupon and when you do, this will make it SO much easier. Next, look to see what coupons are there. This is where I know a lot of people just give up on couponing. I have heard so many people say that there are no coupons for things they use. I hear you, but stick to it for a month at least. I know for sure battery coupons come out several times a month and we all need those, right? So look at the ads carefully and if there is a coupon for something you use all the time, go ahead and cut it out; all 3 of them. Remember they are in a stack so cutting three at a time is a cinch. Put them to the side. Only cut out the coupons you know FOR SURE you will use. If you see something you have been wanting to try or that you might use since you have a coupon then leave it in there. We will come back to this. I use Garnier Fructis shampoo and conditioner so I know I will use these coupons. 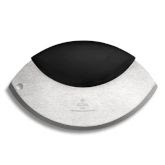 I also know that stores frequently run sales for this brand so again, I know I will use them. Next, you will gather each page and stack them up inside the front page of the packet. As you stack them, look at each page again. Here is where we take note of the coupons you did cut out and the ones you might use at a later date. On your Post-it Note you will write down the brand of the ones you did cut out and draw a line through them. This way, when you start using "The List" you can quickly see that you have already cut out those coupons. Then, for the ones you want to take note of for later be sure to put the date it expires. For example, I might not need Tylenol cold right now. I may not use it at all, but if I do need it I want to remember where it was quickly. Also, as you stack up these pages put the ones you noted in the front of the stack so when you need it, it is right there in front. Now put your post-it note right there on the front of the packet. I can quickly see that I cut out coupons for Garnier, olive oil, and deodorant, and there are coupons for Tylenol cold inside and when they expire. That's is for today. Pretty easy first step, right? Set the packets in a safe place until next time. Put a paper clip on the coupons you cut out and throw them in your purse or diaper bag. If you shop this week and happen to notice one of these is on sale then go ahead and use the coupons. Buy three of them. 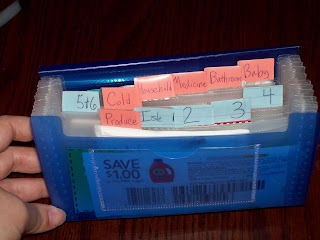 I will post another mini-lesson on Tuesday on how to organize your coupons and packets. I hope this was helpful. I welcome questions here in the comments and I am working on getting an email address where you can email me from this blog. I will answer any questions in the comments or I will amend the post to include the info. A lot of you have shown interest in couponing. 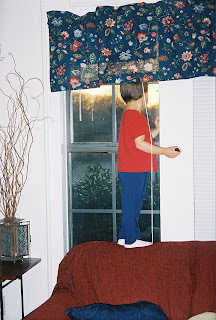 It is a great way to save money without sacrificing more than a few hours. So I will post my first Coupon Help this Sunday. If you have wanted to try this but are not sure how, this will be a great week to start. I will be helping you step by step and we will be starting off small. Updated: I had a good question in my comments. The papers you will need to get in the nearest large city. This is the big bundle that has all the weekly store sale ads like Target, Walmart, Best Buy, department stores in your area, you get the idea. It should have at least 2 coupon inserts inside; Red Plum and Smart Source. We may be getting a 3rd that comes out monthly; Proctor and Gamble. You should be able to find these in the Sunday paper. Yep, still alive but with stuffy noses and little sleep. Be back as soon as said noses clear up. Happy Monday everyone! As you can see I did figure out how to add a email subscription option right over there on my sidebar. On to our menu - My new recipe did not work out last week. I did not have soy sauce when I went to make it. We always have this so I did not even think to look to see if we had enough. Blah! So I will try again this week. Dinner - Spaghetti Pie - this is my new one for this week. I got it from The Deceptively Delicious cookbook. Parmesan and garlic. Mix well and form into 1/2 inch balls. In a large bowl, stir the cooked pasta, tomato sauce, cottage cheese, carrot puree, salt and pepper. Spoon the mixture into the pie plate. smooth top and scatter meatballs on top and sprinkle with mozzarella. Bake uncovered until the center is firm and the cheese is bubbly 25-30 minutes. Lunch - We are going to a b-day party where lunch will be served. Dinner - We may attempt to eat out with the girls after the party. Wanna little taste of cuteness? I have been working on an update, but I just couldn't resist posting this before we leave to visit family. Look! They have the same smile! Ok, So I thought I would do a quick check-up on my resolutions at a month, (ok a month and a half) out. ~Ooo...not good, not good at all. I am reading, I can't stay away from my favs. But I don't comment because I am usually flying through them at the end of the day. I need to step this one up. More comments, coming up!! ~I am doing better about this. I am cooking a lot more and staying somewhat on top of things. Again, a lot better but still need to work on this. In May we will be debt free, Whoo-hoo!! So I get to start putting some money aside to do my improvements to the house. Yay!! 3. Be more conscience of my spending. ~I have done really well with this I think. I have thought about bigger purchases and then planned them out. I try to look for sales on clothes and use a coupon whenever I can. I have not just thrown money away on nothing stuff. Yep, I have def been better in this area. 4. Be better about taking care of myself and my body. ~I have cut out sodas, sweet tea, and cut down on my sugar intake. I have started eating more fruit and veggies and being more consciousness about the fat grams and calories that are going into my body. I wish I could say that I have been more active, but it just isn't so. And I am ok with that right now. I am down 6 pounds of the weight I gained back from the holidays plus add the 1 pound from this week and I am on my way. Yay me! I have been getting back to my skin care routine and I have gotten out of the house with friends several times. I got a great tip from a good friend Linda. She knows of a salon near me that uses a certain type of haircutting technique that works with my style of hair, you know, frizzy, unmanagable, really horrible to work with hair. I have done a little research and I am so going to go for it. I am so so excited about it. The only thing is it is a tad pricey so I will have to plan for it :-) Thanks Linda!!! ~Ummm...I make my own baby food. Does that count?? ~Oh i was doing so so well at this until a few weeks ago when we started getting mass emails about our friend Brook and her girls. I could barely wade through them all and since then I have struggled. It sat at 247 for 2 weeks before I got it back under 100. It sits at 46 right now. Back on track I go. All in all, ok I think. It is good to check up on things every once in awhile. I hope to do this every month. We shall see. How are your resolutions going?? So my goal was to lose 1 pound and (drum roll please...) I DID!! Which means I am the least amount of weight I have been since before I got pregnant!! Yay!! So happy!! I think I am finally in my groove. I am really watching what I eat and eating more fruit and veggies and drinking water. I put spinach on my sandwiches instead of lettuce. I have all spinach salads with tons of veggies and very little dressing. I will be talking to those of you who wanted to do a weight loss blog. Monica posted this and I loved it! I jumped on it. 1. Be one of the first THREE bloggers to leave a comment on this post, which then entitles you to a handmade item from me - something crafty or yummy, who knows?! 2. Winners must post this challenge on their own blog, meaning that you will Pay It Forward, creating a handmade gift -anything!- for the first THREE bloggers who leave a comment on YOUR post about this giveaway! 3. The gift that you send to your 3 Friends can be from any price range and you have 365 days to make/ship your item. This means you should be willing to maintain your blog at least until you receive your gift and have shipped your gifts. And, remember: It’s the Spirit and the Thought That Count! 4. When you receive your gift, please feel free to blog about it, sharing appropriate Linky Love! If you are not one of the Top Three Commenter's on this post, you can still play along. Go ahead and start your own Pay It Forward chain, and encourage your blogging friends to do the same! SO, REMEMBER... Pay it forward! I can't wait to see who my three commenter's are - and start making their special homemade item. This is what Zachary would do when Gary came to pick me up from a date or drop me off. He hadn't met him yet so he would stare out the window as he drove up to "check him out". This created quite the curiosity in him, so by the time I was ok with Gary meeting him he was super excited about it. It was a super smooth transition. Check below for "Works for me Wednesday"
I have been wanting to play along with "Works For Me Wednesday" for awhile now. So here is my first post. 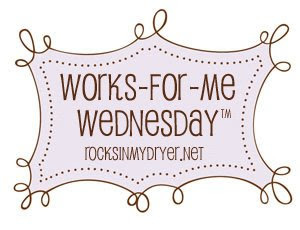 Go to Rocks in my dryer and share what works for you.